Like all industries, real estate is being constantly reshaped by technology. We’ve been following the progress of virtual reality for a while, and had an opportunity to take a first hand look at the current state of the art. A company called Matterport developed a specialized camera that takes 360 degree photos, and then uses the resulting images to present the home in different ways. Below is an example of their presentation for 88 Terry Road in Hartford’s West End. One presentation is the “dollhouse” view, which presents the entire building with the exterior walls missing. You are able to spin the house to look into the different rooms. This presentation gives a sense of the floor plan, and how the different rooms relate to each other in space. Another presentation is the “floor plan” view, which is basically the same as the “dollhouse” except you are looking straight down from above. You can select which level of the home to view, and see the different spaces with their furnishings in place. Next, Matterport lets you “explore 3D space.” This view positions you at the various camera locations and allows you to pan side to side, and up and down, to see in every direction from that spot. You can move from spot to spot, touring the entire home. The navigation and overall experience is similar to the online mapping sites’ street views, and works well on a phone. Finally, the “virtual reality” presentation makes the 3D space immersive by allowing you use VR goggles to stand at the camera locations and look around as if you were physically standing in the building. This is the newest presentation format, and the one that I was most excited to try. I wanted to see what kind of experience the system offered. Getting involved in virtual reality sounds expensive, but it doesn’t have to be. You don’t need cutting edge technology to tour a house, so I decided to start with the most basic experience. 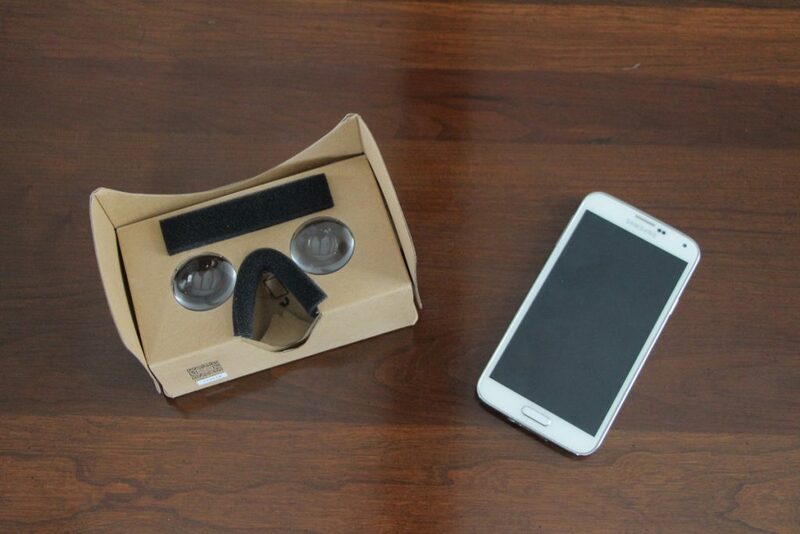 I brought a Google Cardboard compatible viewer for $5 at my local electronics store, and paired it with a retired cell phone. It was easy to get the equipment up and running, and accessing the VR experience for the house was equally simple. As my first virtual reality experience, immersing myself in the home tour was easy and enjoyable. The software makes it obvious how to jump between camera locations, and the processing power on my old phone was more than enough to allow the images to move seamlessly as I turned my head from side to side. I had fun exploring the house. My best experiences in traveling though the home were while sitting in my desk chair, which allowed me to easily spin 360 degrees without worrying about falling over or walking into anything. The question we’re hoping to answer with this test run is this: is virtual reality a good way to present a home so that it makes a favorable impression on potential buyers? It’s a cool experience, and it’s fun to try out, but how will buyers use it during their home search? Most technologies are adopted very slowly in the real estate industry. The decision to use virtual reality, or any new technology, is made on an agent by agent basis. Every market is highly fragmented, with even the best agents only listing a small percentage of the properties. Since marketing expenses like this are fronted by the listing agent and only covered if the house sells, agents can be reluctant to try new technologies that have a high cost and unknown value. For example, many agents still take their own listing photos rather than pay for a professional photographer. In the near term, buyers won’t be able to experience the majority of the homes they are interested in touring using virtual reality. If our listings offer VR tours, will that be an advantage or a detriment? Only a small percentage of buyers are likely to choose to experience the home in VR. And, a virtual tour is highly unlikely to be sufficient to convince a buyer to submit an offer. But will buyers feel like the VR experience is enough to eliminate a property from consideration? My goal as a listing agent is to get buyers into the house, since that’s where the purchase decision is made. Another way to think about the VR experience is as an alternative to an open house. A main benefit of open houses is that it gives buyers who have already seen the house in person an opportunity to explore it again and reflect on how they would use the space. Will buyers use the virtual reality tour to reinforce the positive impressions they had while touring a home in person? We would love to get additional input on virtual reality as a technology for presenting houses. What do you think? Would you consider exploring a home in this manner? Does the technology and presentation make you think more favorably about the home? Please leave a comment, or send me a quick note at KyleB@KyleB-RE.com.